Physicool is a new and unique product range including reusable bandage that combines cooling, compression and support. Physicool bandages are a perfect solution for sprained wrist, knee pain, knee injuries, ankle injuries, general swelling, tennis elbow, twisted ankle, Golfer elbow,muscle strains, sprains and knocks caused by sports injuries. The bandages may also be beneficial in reducing the swelling and pain from arthritis and Joint pain. It is highly effective and quickly reduces swelling and pain. The bandage can be applied in seconds, you just need to have it at hand, and its effects are long lasting, even after the bandage is removed. Physicool works by drawing heat out through rapid evaporation, as opposed to most other products that work by driving cold in. It's perfect for domestic, sport and leisure use. The Physicool bandage is a specially fabricated and treated bandage that can be used straight out of the packet. Treat strains and sprains with Physicool. Physicool bandages are a new, unique stretchy reusable bandage that combines cooling with support and compression (remember “RICE”) and the bandages work by drawing heat out through rapid evaporation, as opposed to most other products that work by driving cold in. Physicool gives instant treatment for inflammation and bruising of muscles, tendons and ligaments combined with a long lasting cooling effect even after the bandage has been removed. Physicool’s reusable cooling bandage combines a cold compression wrap with instant cooling, and support to combat pain and speed up recovery. Physicool is a recognised medical treatment used by athlete’s and physiotherapists to treat inflammation, swelling and bruising within muscles, sprains, tendons and ligaments. Provides all the benefits of a cooling aid, but without the need for refrigeration. 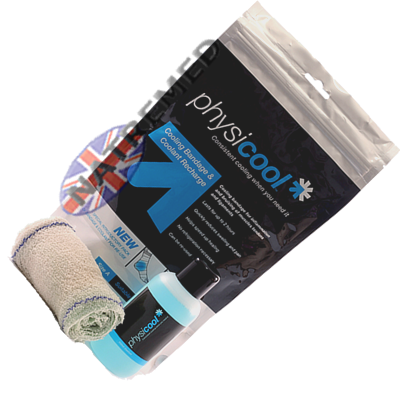 Physicool’s cooling bandages are a must for sports rehabilitation. Physicool works by rapid evaporation - drawing heat out of an injury. Because the bandage is fastened to the injured limb, it provides consistent, ergonomic relief, quickly reducing swelling and pain whilst helping speed up healing and recovery time. Each bandage has a Velcro strap that holds it in place without creating a pressure point. Initially charged with 2-3 hours cooling the bandages are reusable and Physicool’s unique cooling effects will still be felt long after removal. Physicool bandages are a perfect solution for sprained wrist, knee pain, knee injuries, ankle injuries, general swelling, tennis elbow, twisted ankle, Golfer elbow,muscle strains, sprains and knocks caused by sports injuries. The bandages may also be beneficial in reducing the swelling and pain from arthritis and Joint pain. 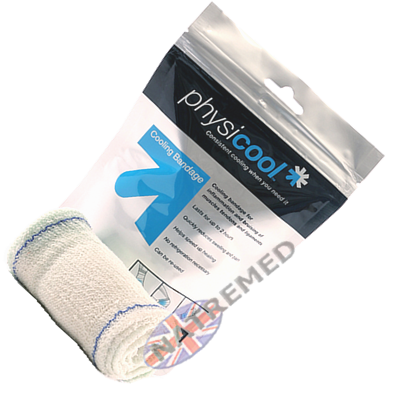 After using your cold compression bandage Recharge with Physicool Coolant, its then ready for instant use should you need it. Support is a vital component in any fitness programme. Nobody plans injuries: But they do Happen. 1 Physicool Cooling Bandage completely reusable and gives instant access to cooling, compression and support this provides instant treatment for inflammation and bruising of muscles, tendons and ligaments. Size A: 10cm by 2m. Size B: 12cm by 3m. 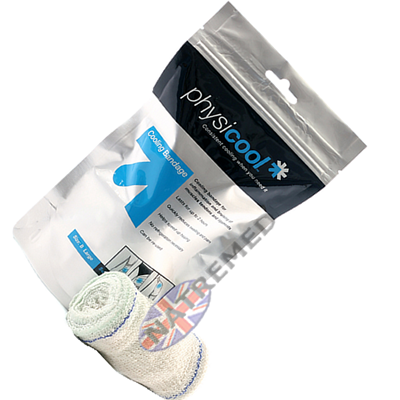 Physicool Combination Pack gives instant access to cooling, compression and support this provides instant treatment for inflammation and bruising of muscles, tendons and ligaments. Physicool Coolant allows the Bandages to be recharged by spraying the coolant directly onto the bandage whilst it is in position on limb. This provides instant treatment for inflammation and bruising of muscles, tendons and ligaments.